I looked at the eBay link you provided. In the past, several "vintage" Marvins offered on that site turned out to be fakes or knock offs. I'm going to get some info on the ones currently being displayed there and report back. So, just to follow up on that $1,299 vintage Marvin on eBay at http://bit.ly/4mWx1L, it appears to be a genuine one from the US. 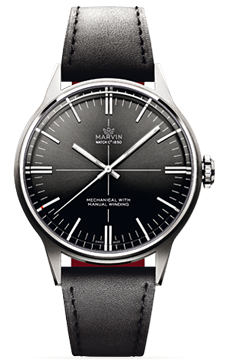 The movement is not a Marvin one but still prized by collectors (Valjoux). To us the $1200 price tag seems a bit high. Someone at Marvin bought a similar model (same condition) a couple years ago for half the asking.